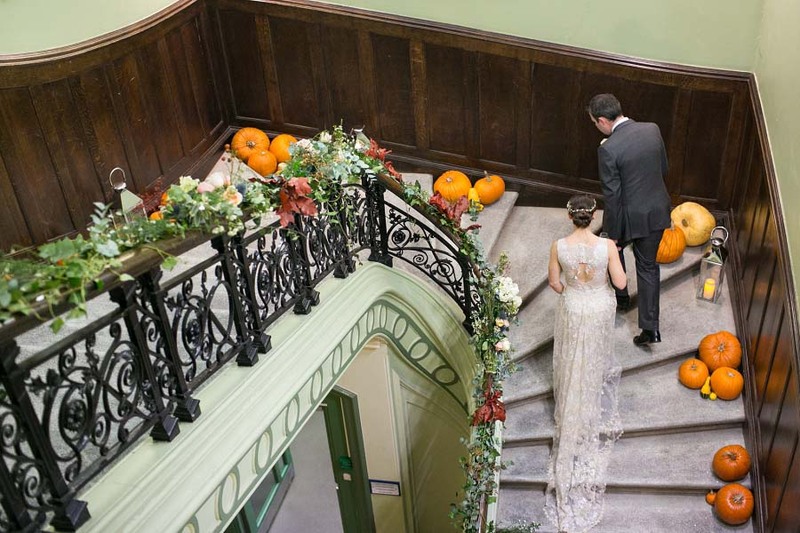 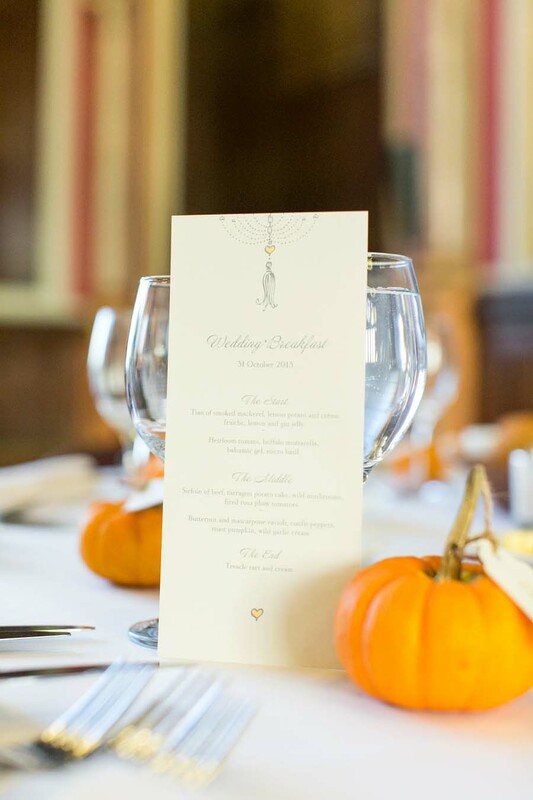 Rachel & Alex styled their wedding day around what they hoped would be a crisp sunny autumnal day, also bringing in some aspects of Halloween through the giving of pumpkin favours, the fairytale staircase lined with large pumpkins, lanterns and beautiful vines. 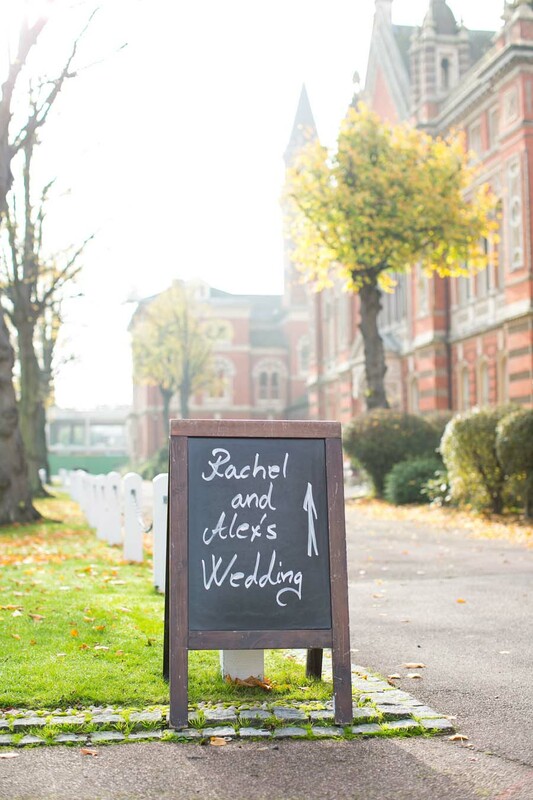 Words by Rachel. 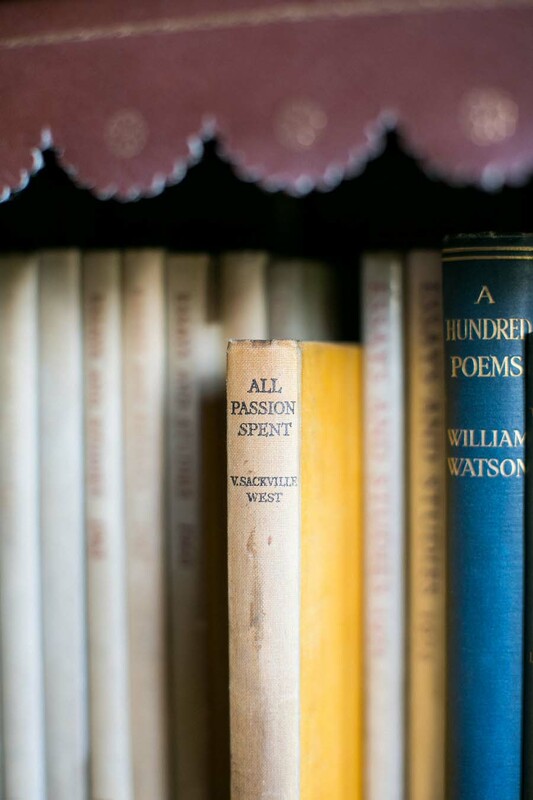 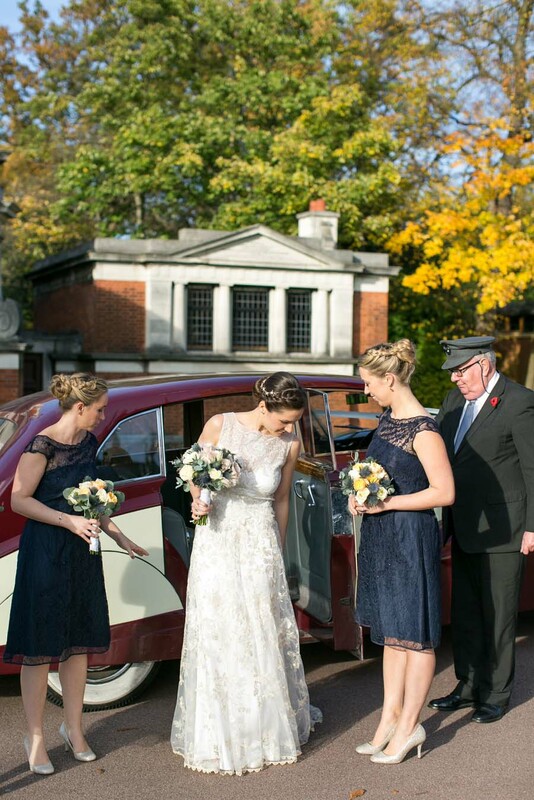 Images by Anneli Marinovich Photography. 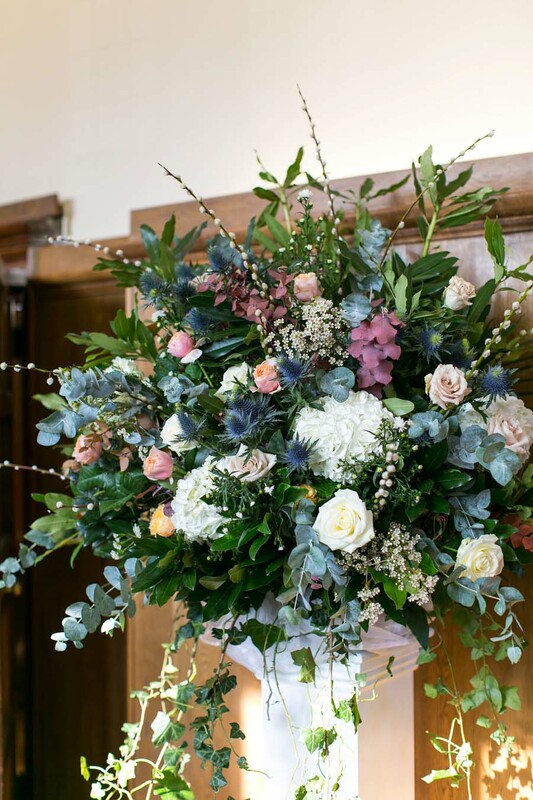 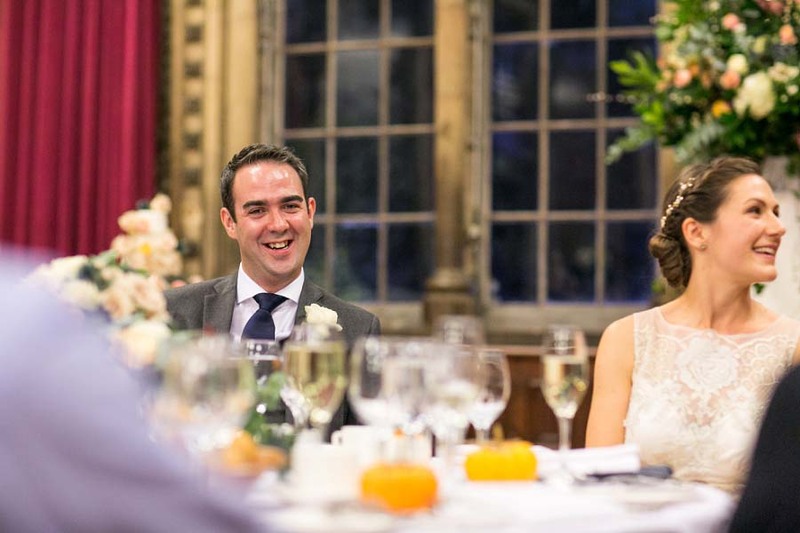 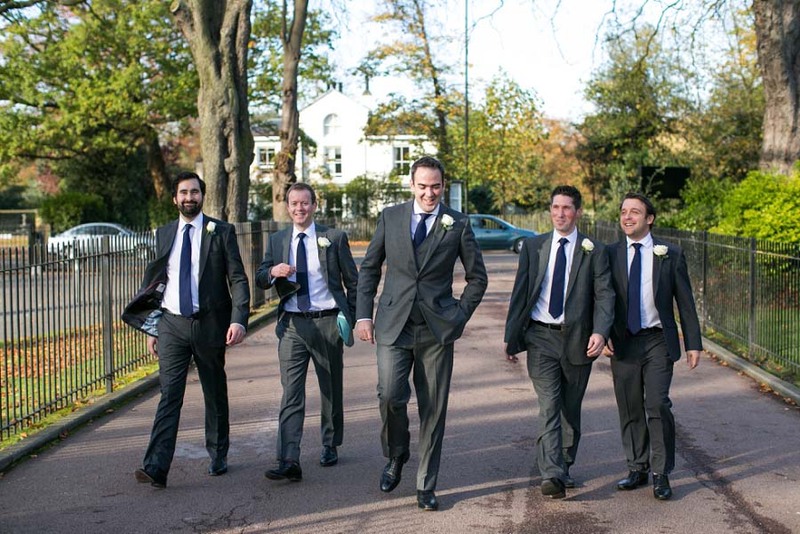 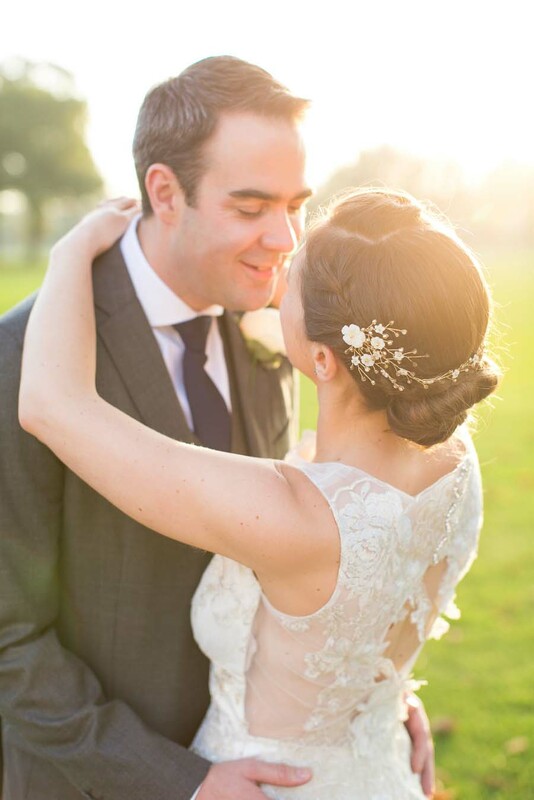 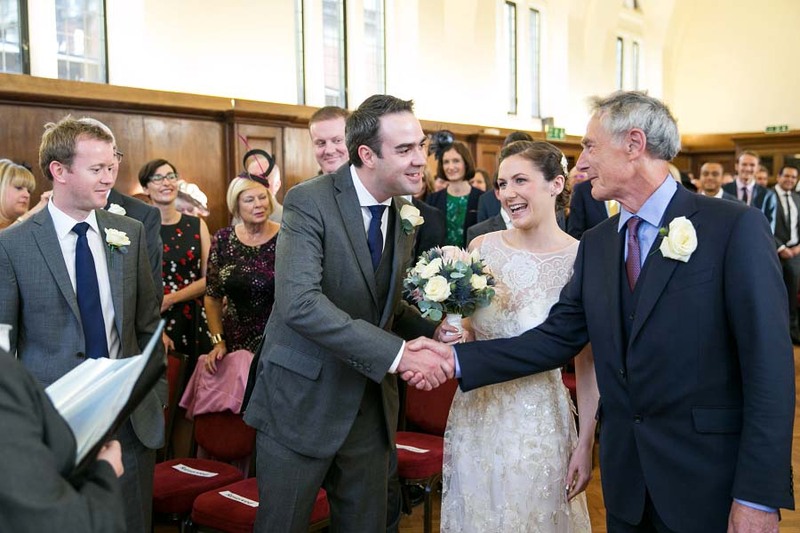 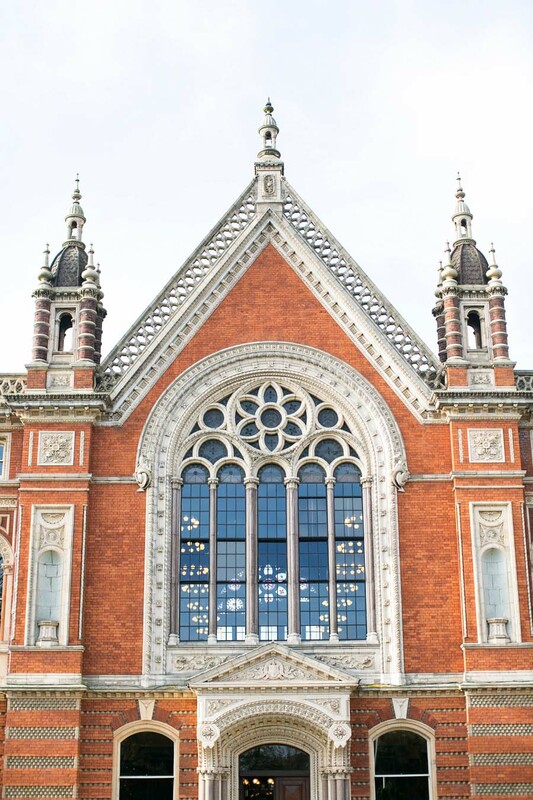 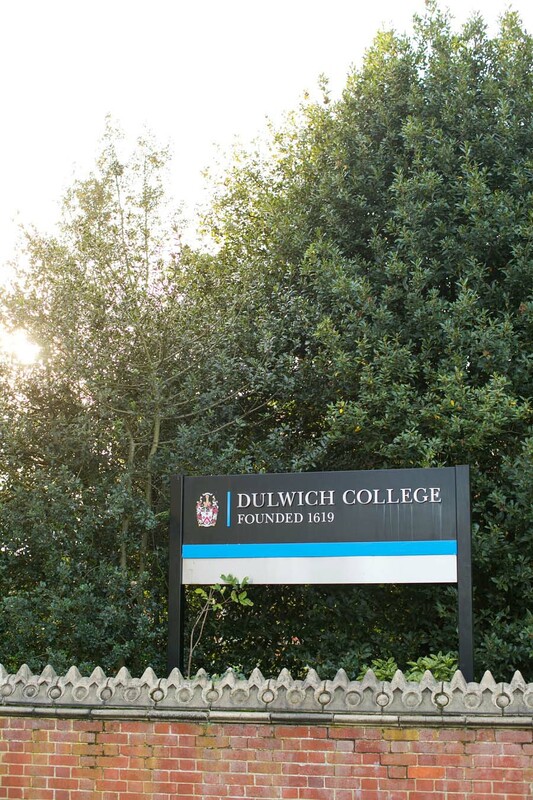 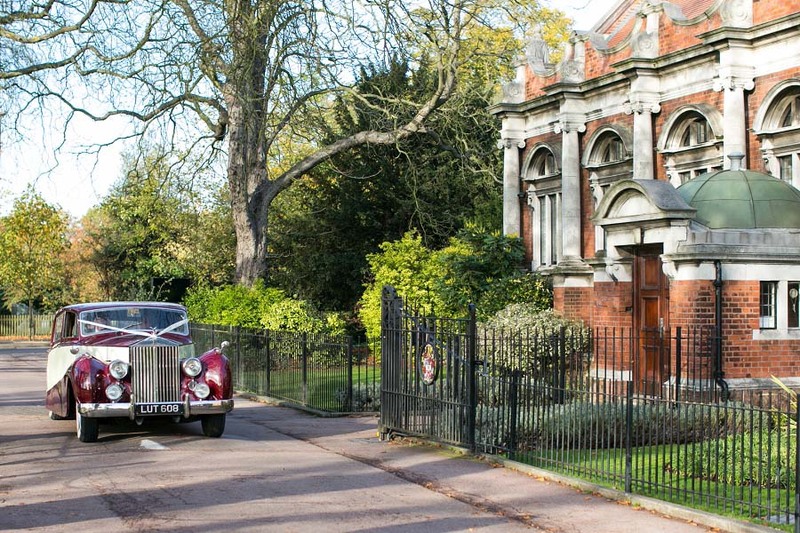 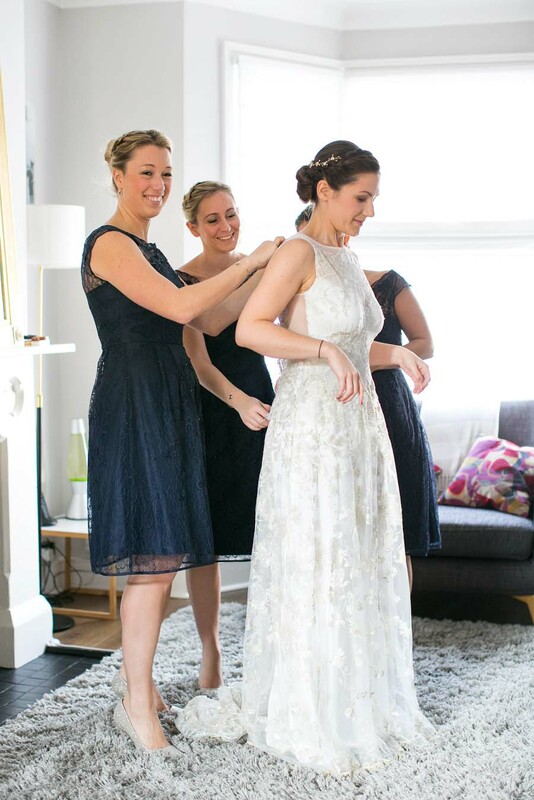 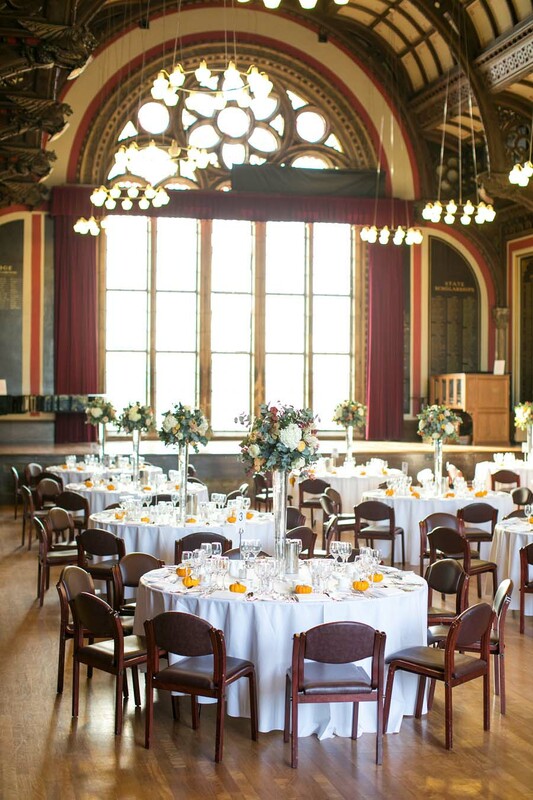 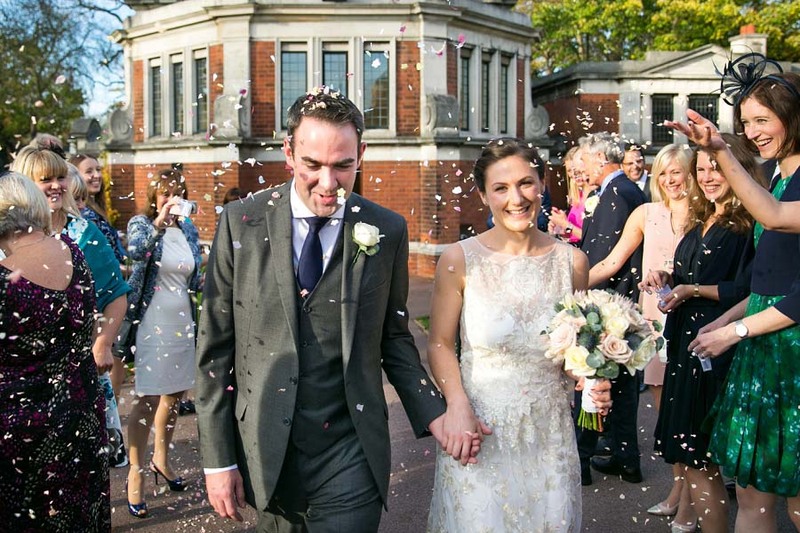 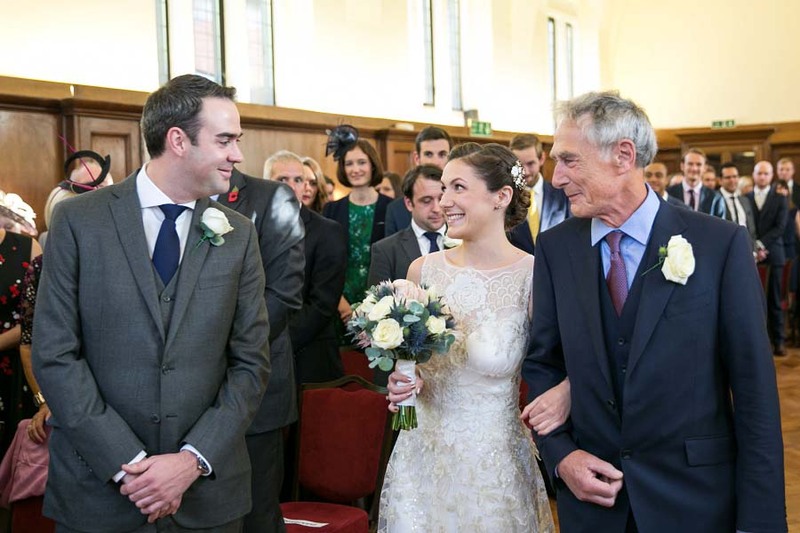 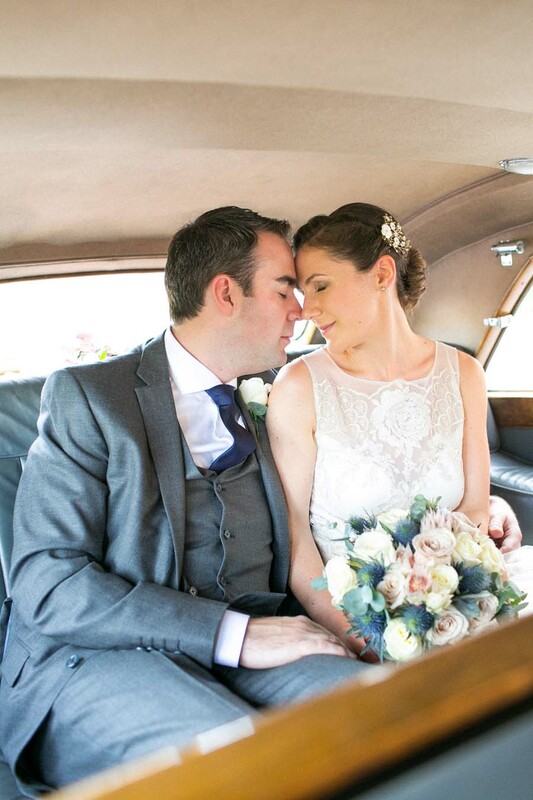 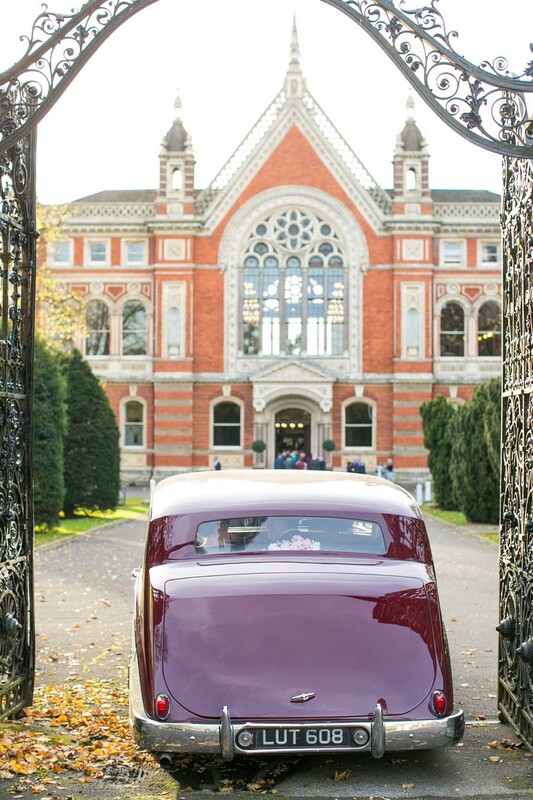 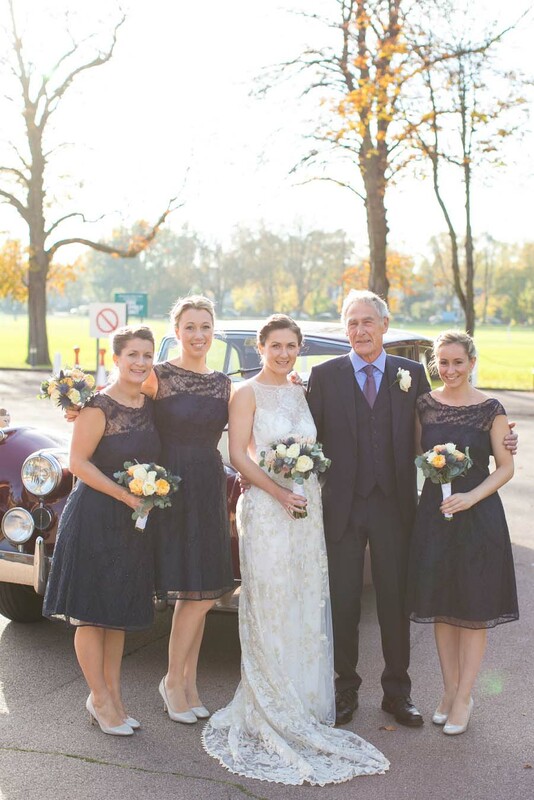 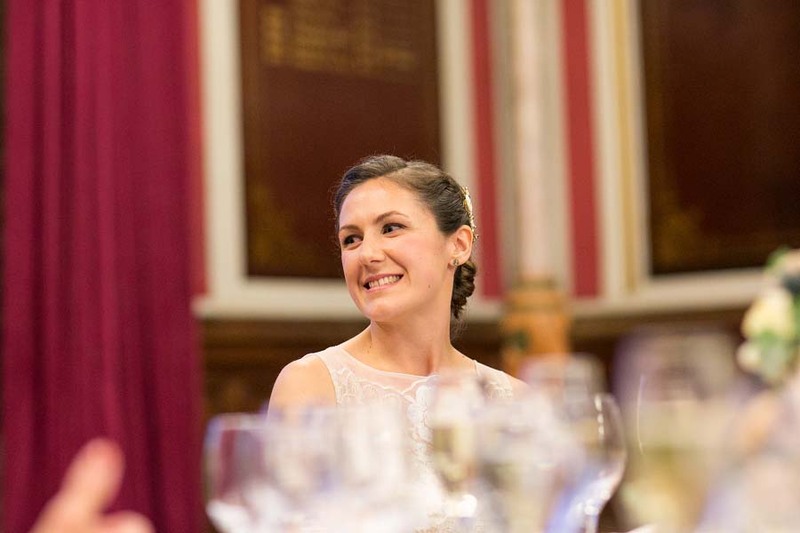 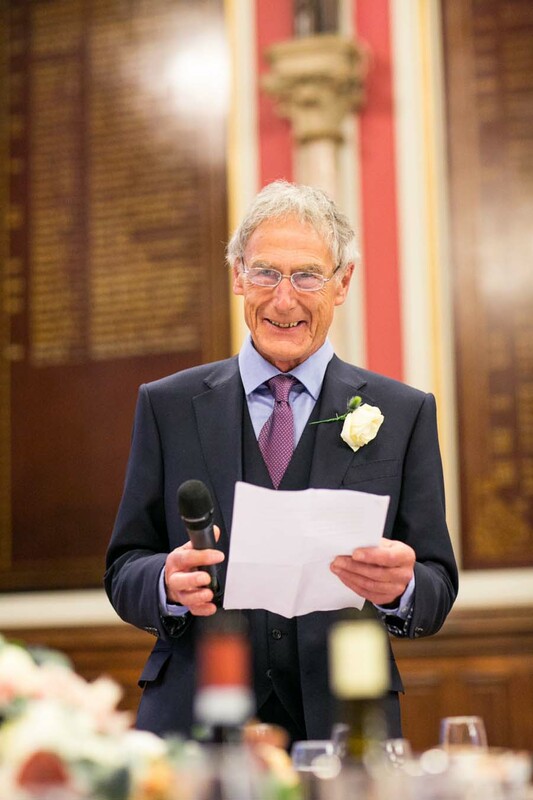 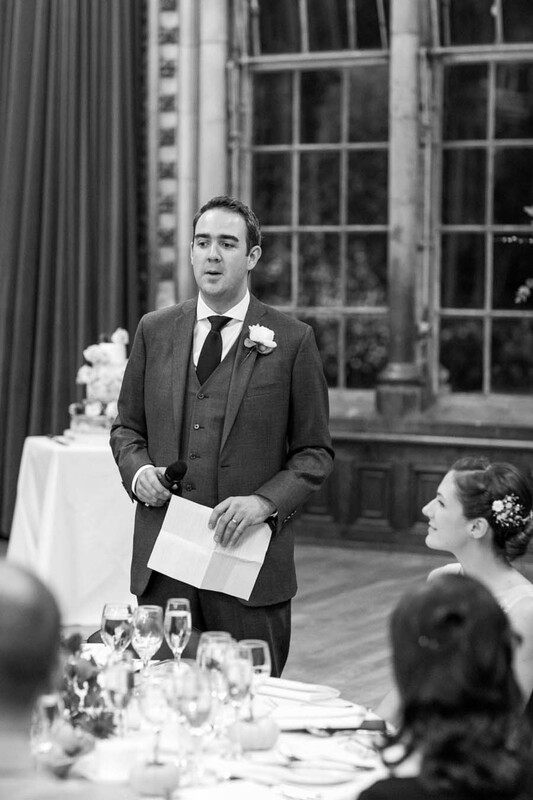 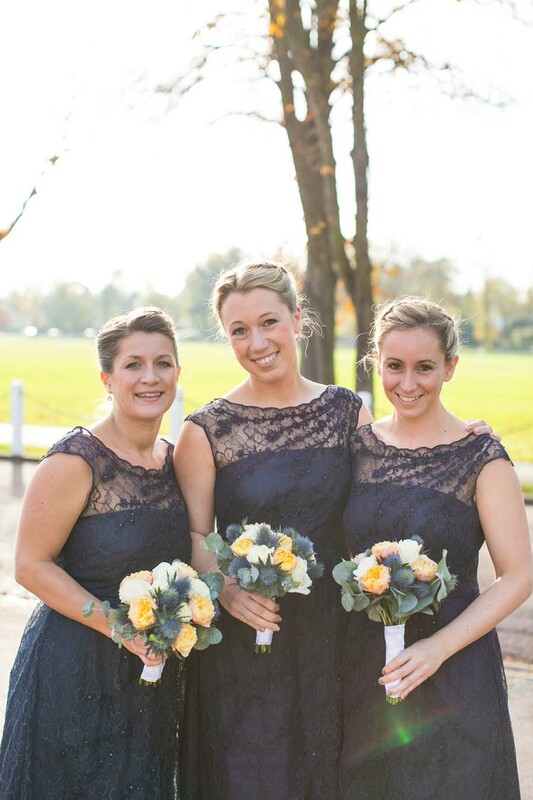 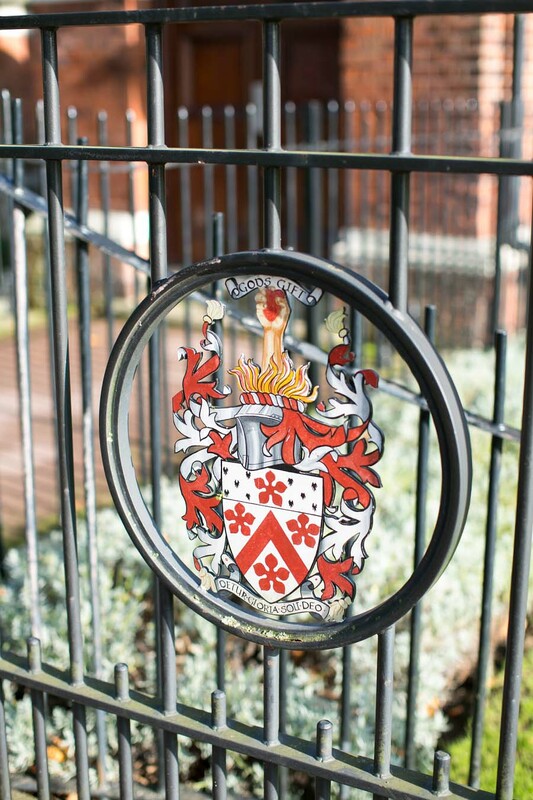 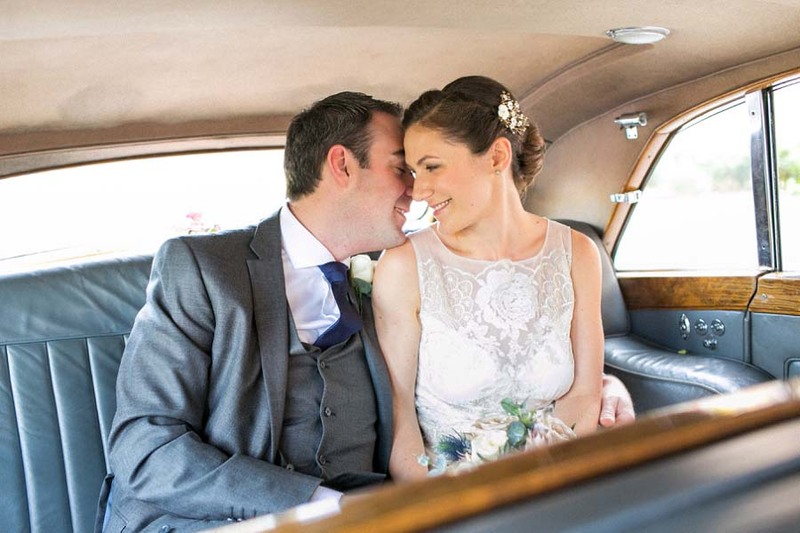 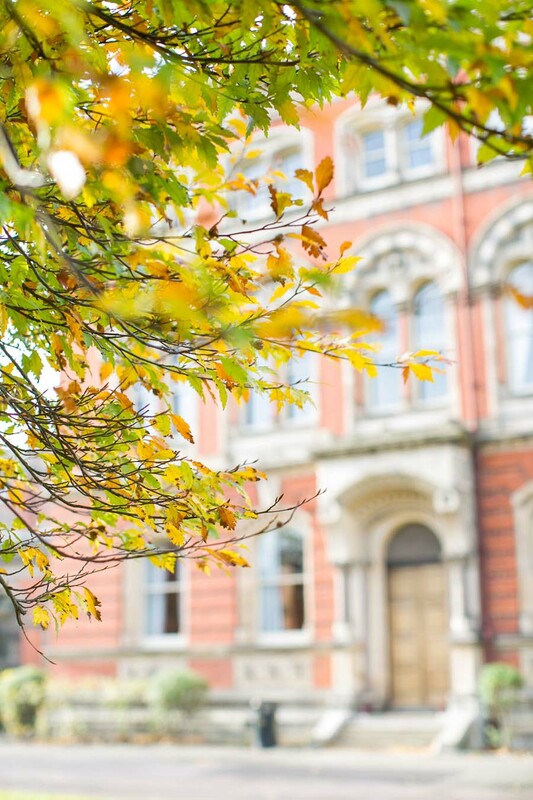 We chose Dulwich College as our wedding venue because we wanted a venue close to where we live, which was an easy journey for the majority of our friends and family. 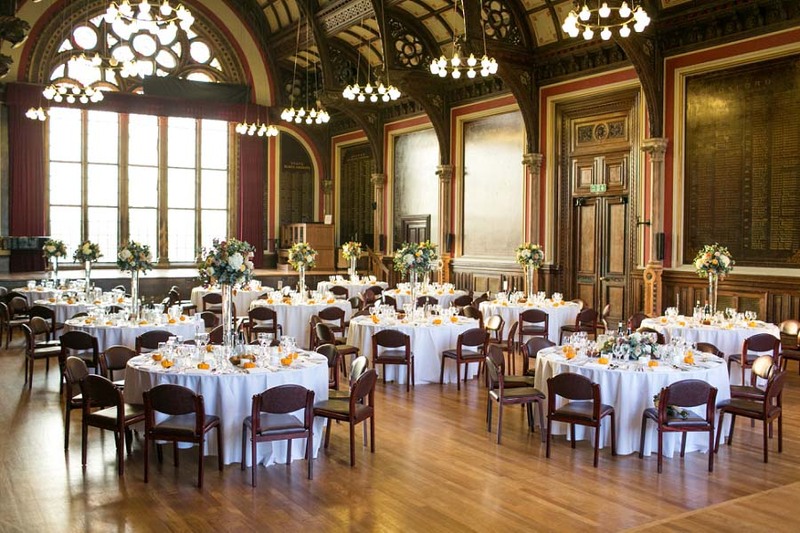 The college itself is also a magnificent building, where each part of the Wedding day takes part in differents rooms of the college. 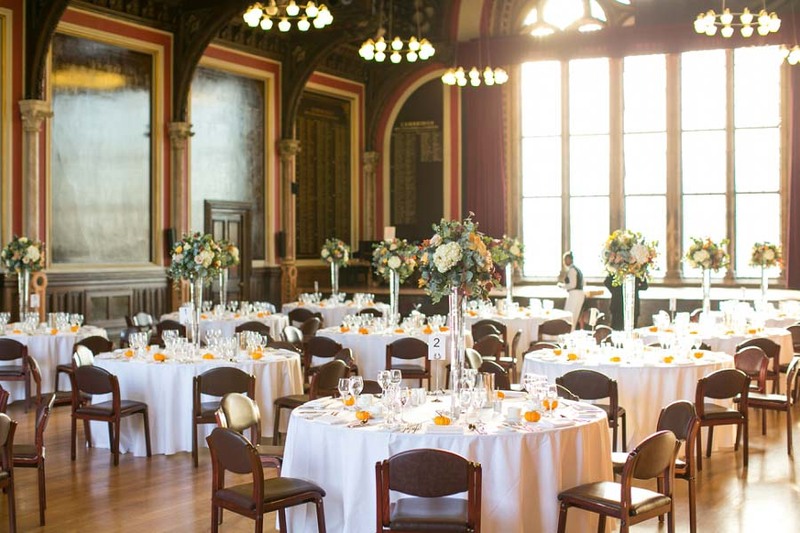 The Old Library, where the ceremony took place is light and airy, whilst the grand Great Hall was a perfect space for the Wedding breakfast. 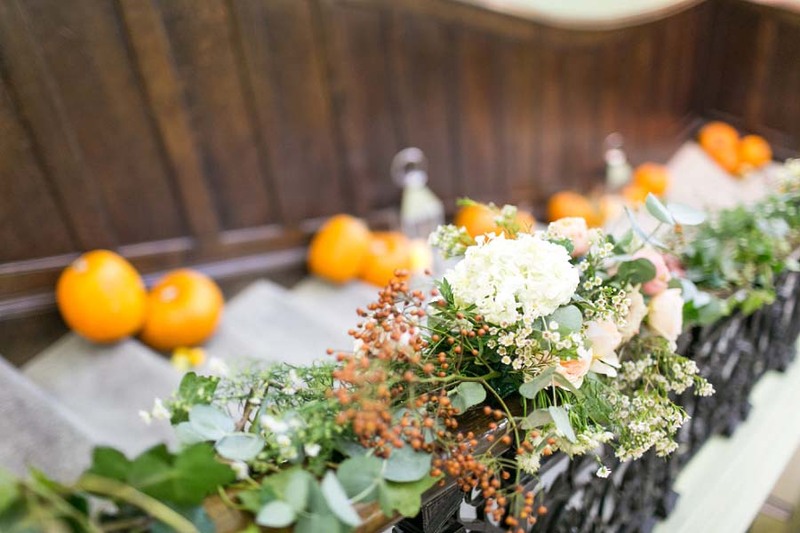 I struggled to narrow down the colour choices for the flowers, but wanted a autumnal mix which the florist (and friend), Victoria really mastered. 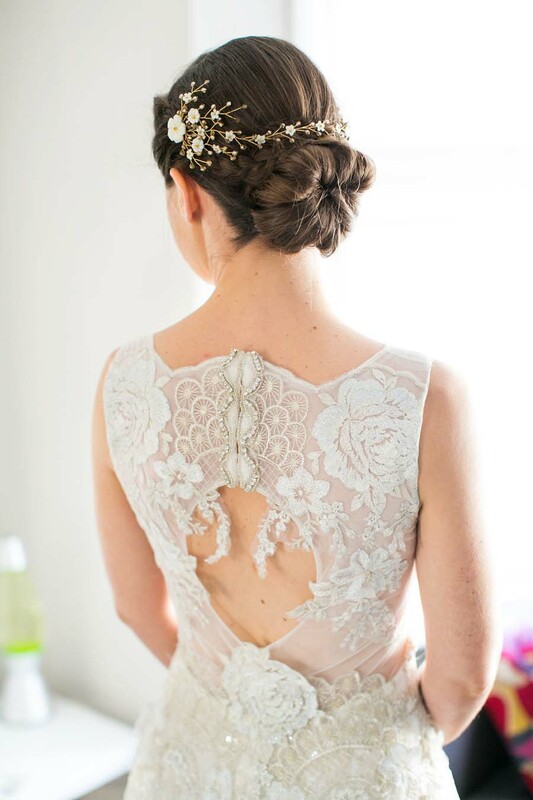 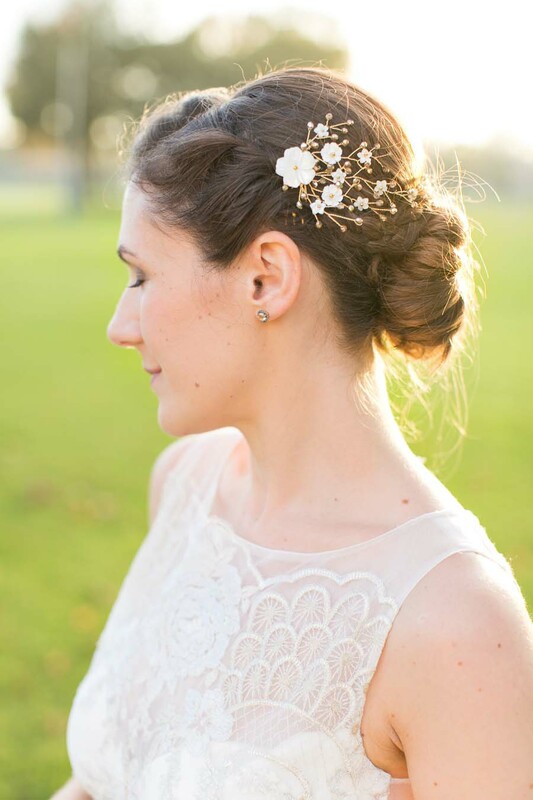 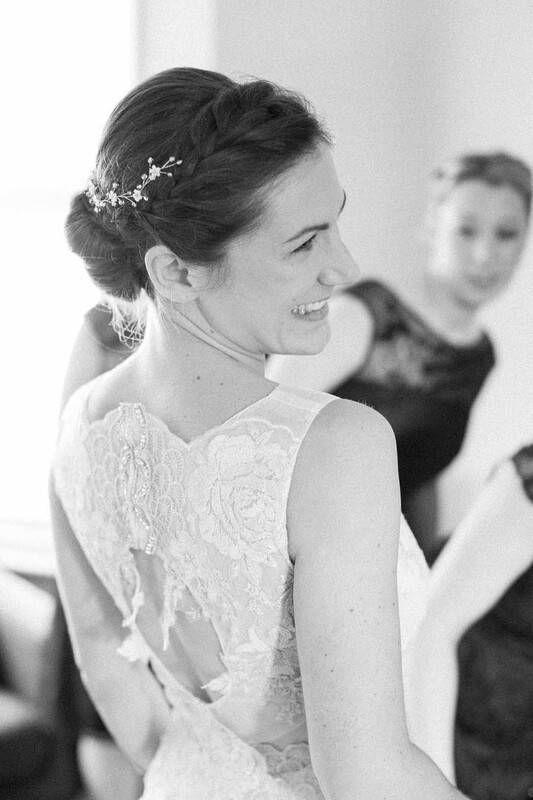 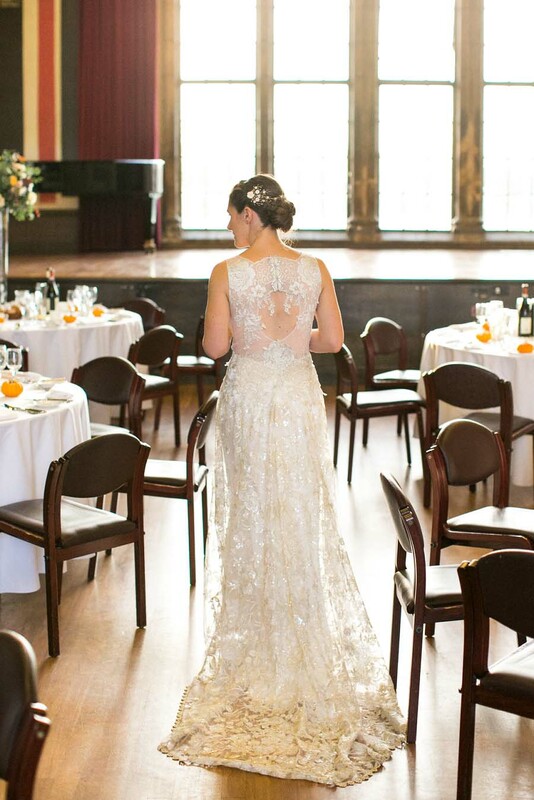 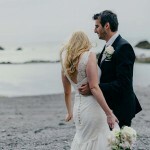 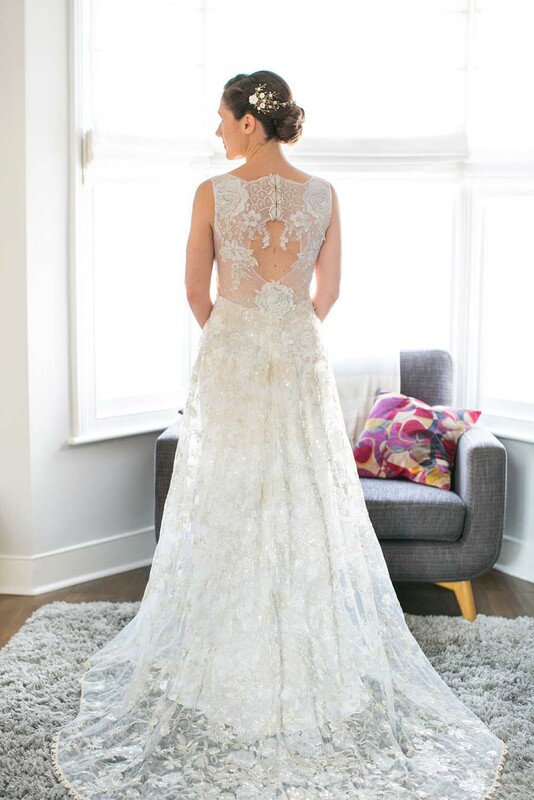 My wedding dress was ‘Eden’ by ClairePettibone. 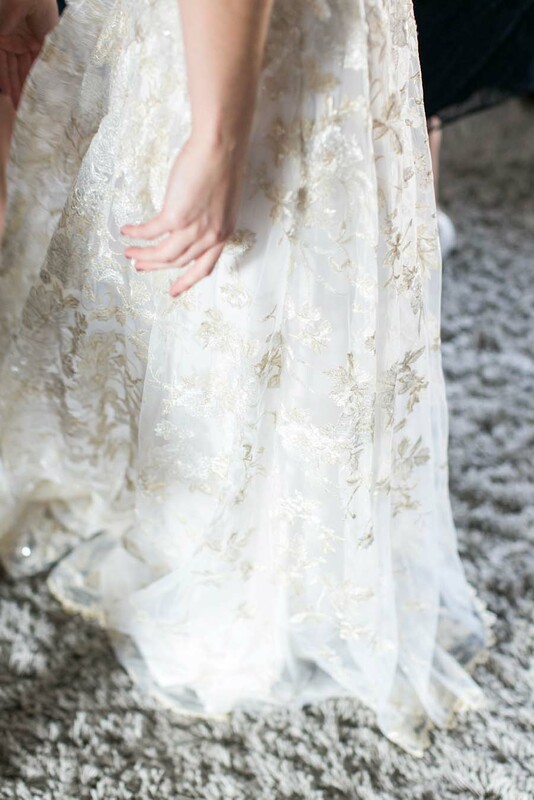 This dress had the feel of being in an enchanted fairy tale! 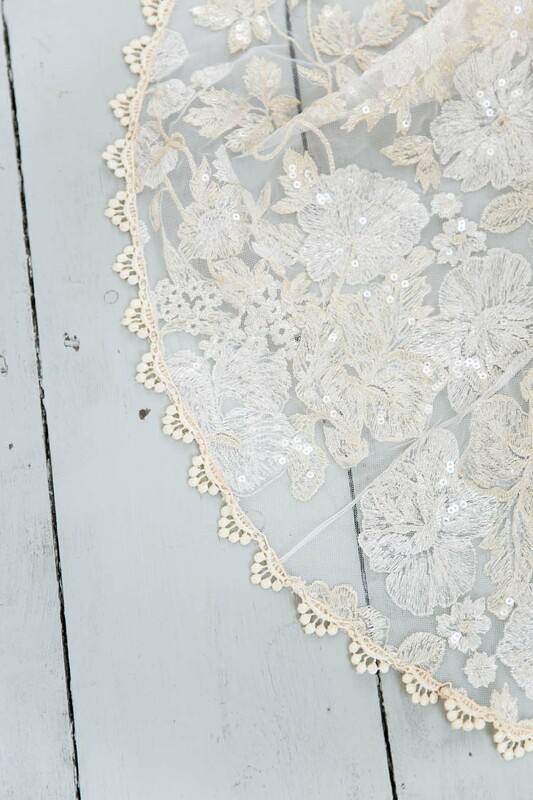 The intricate lace and golden embroidery is truly beautiful, with applique flowers, sequins and a delicate keyhole back. 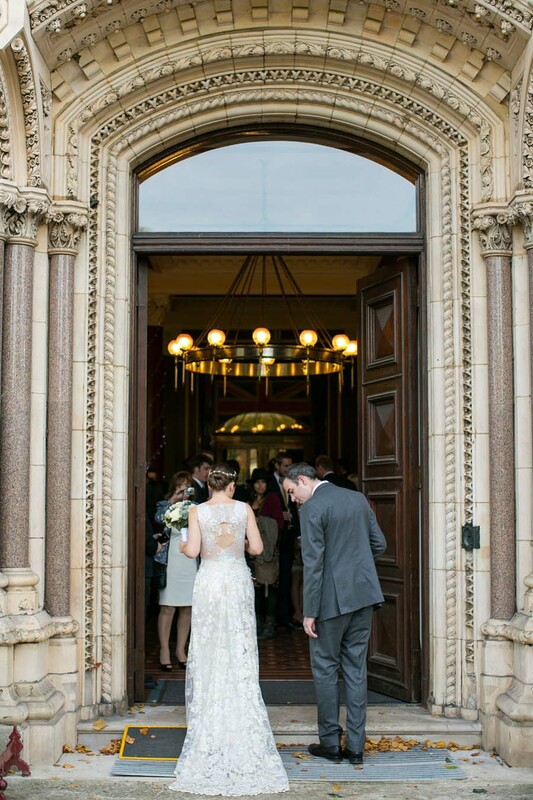 The dress is also a simple A line shape which I felt really comfortable in! 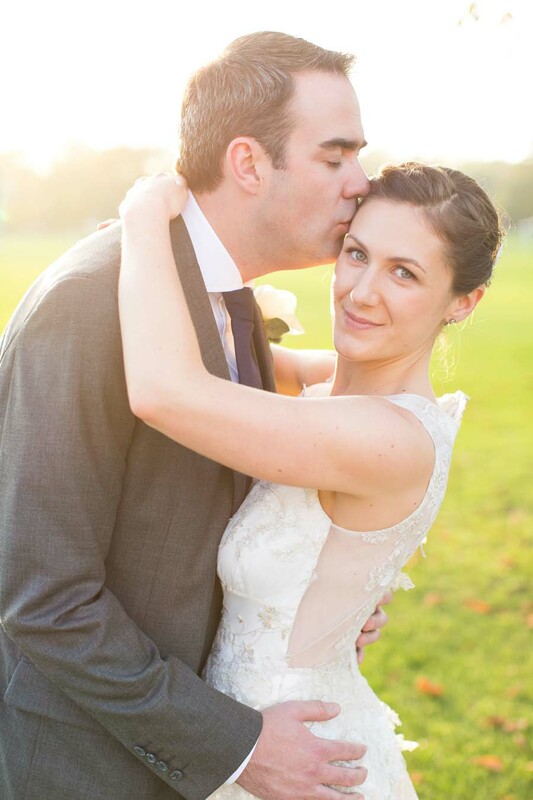 Alex proposed on a holiday to Argentina, an impromptu proposal on a tree lined avenue in Buenos Aires. 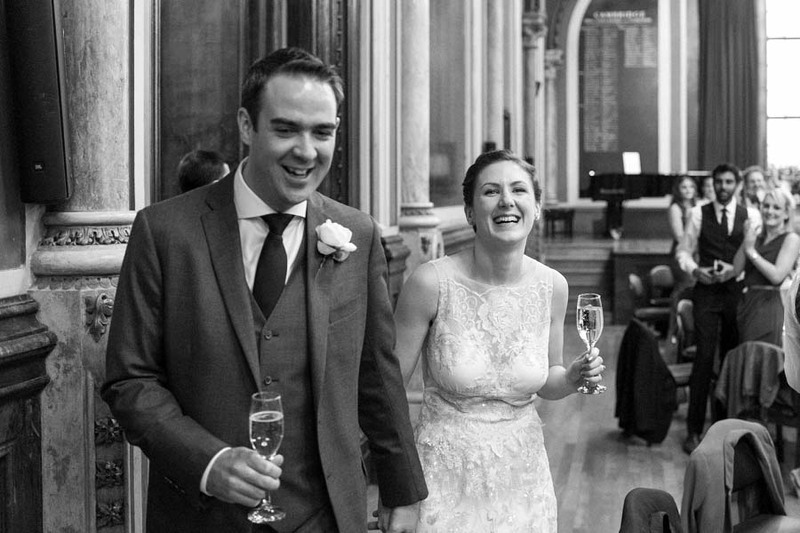 We celebrated in the evening with Argentinian steak and a delicious bottle of Malbec. 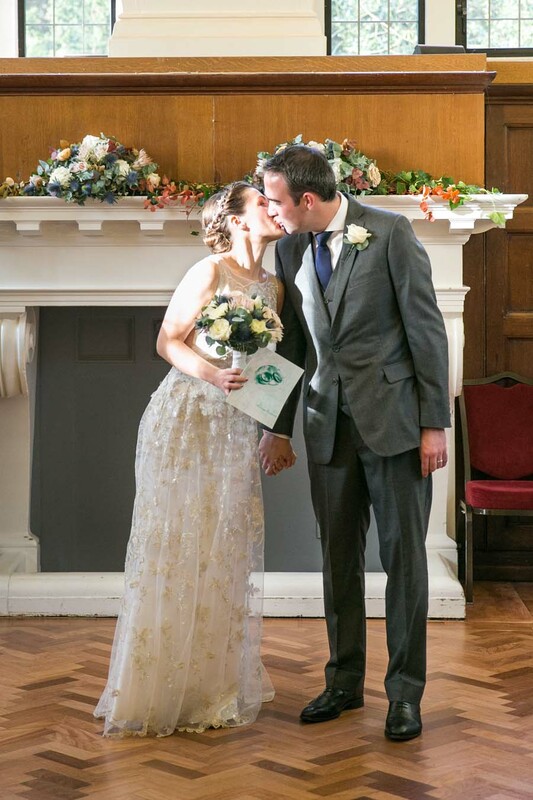 My favourite part of the day was the ceremony, whilst it was all a bit daunting, saying our vows in front of friends and family will always be a special and memorable moment in our lives. 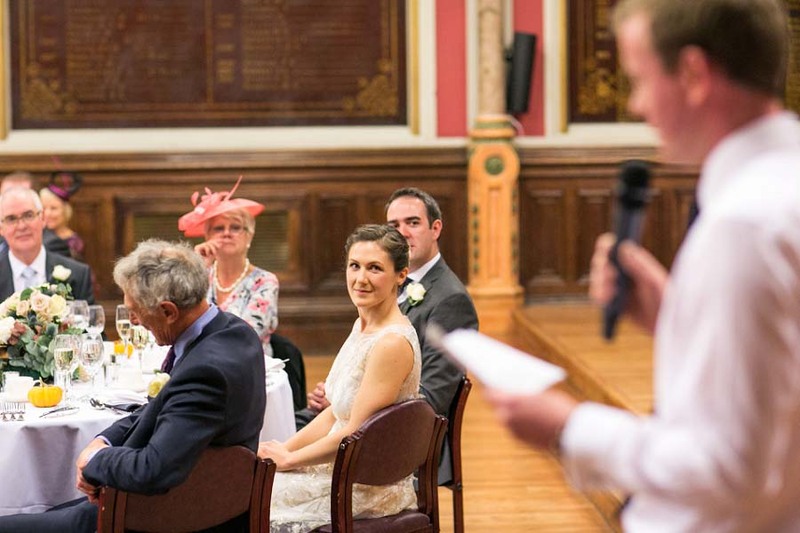 I also really enjoyed sitting back and listening to the speeches. 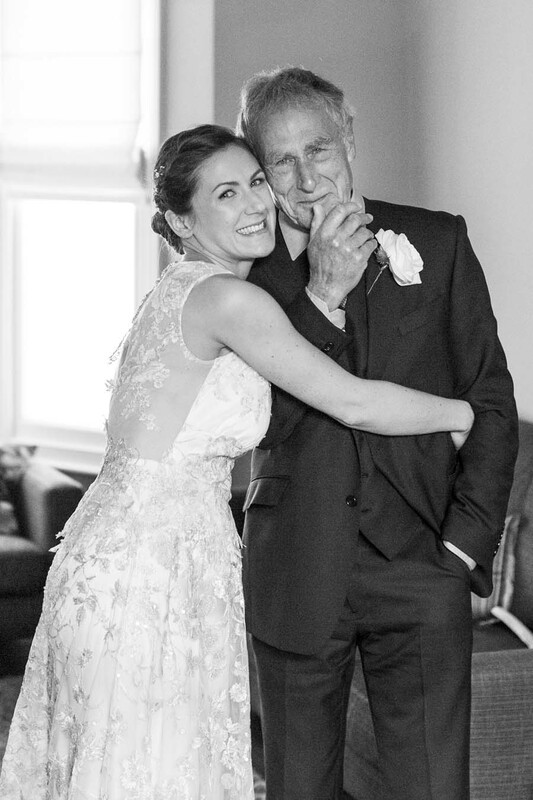 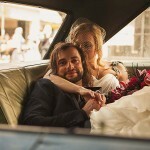 Our wedding photographer was Anneli Marinovich. 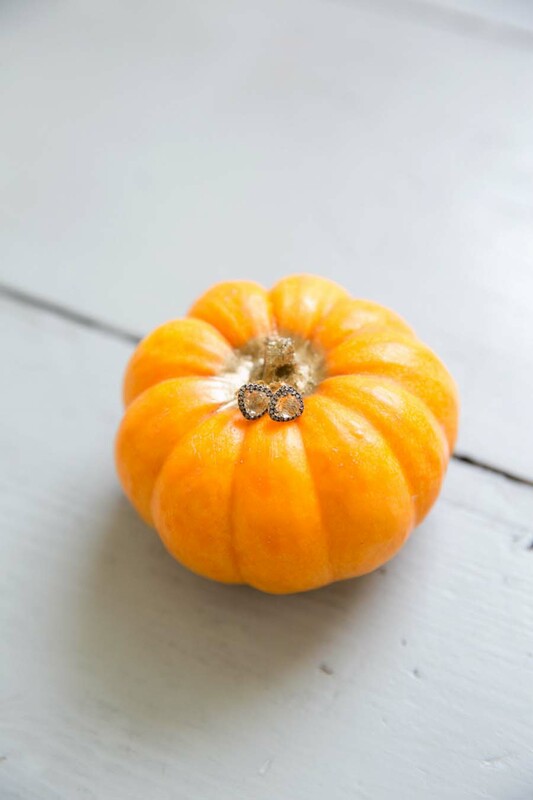 As it was Halloween I provided each guest with a munchkin pumpkin. 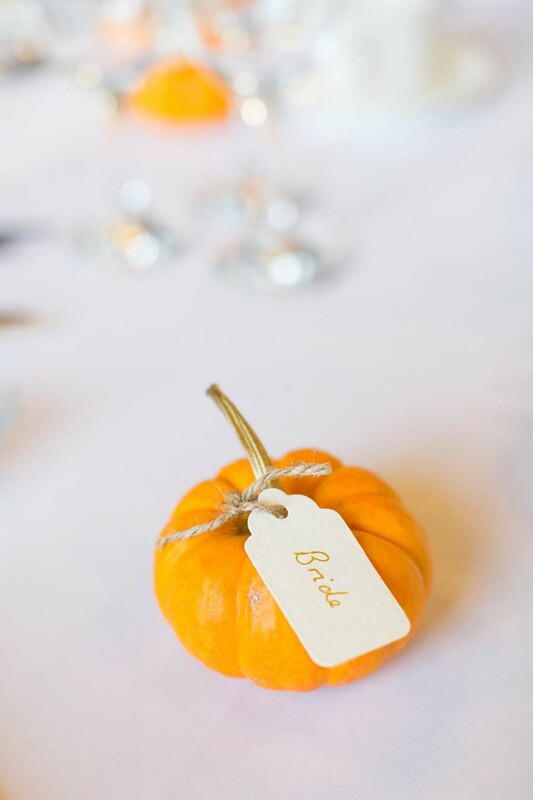 One evening my parents helped to drill holes in the stalks, spray the stalks gold and attach name tags to 100 pumpkins! 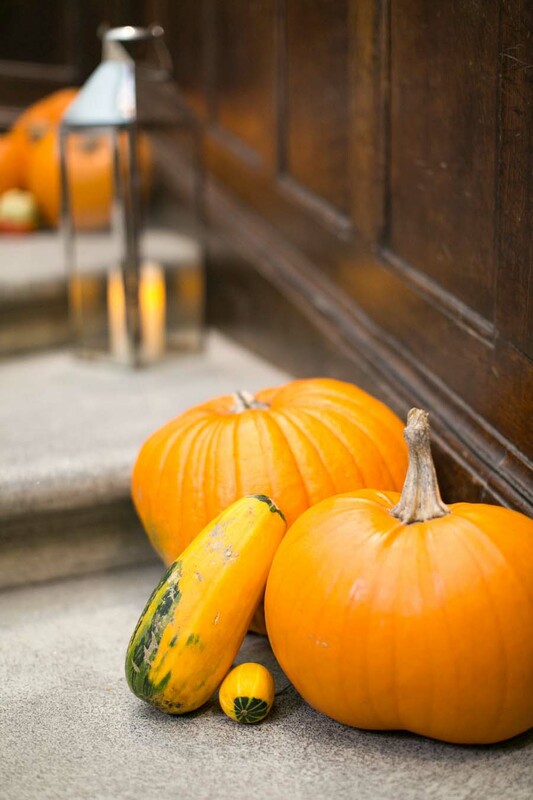 Our guests had a healthy supply of pumpkin soup for a good few weeks! 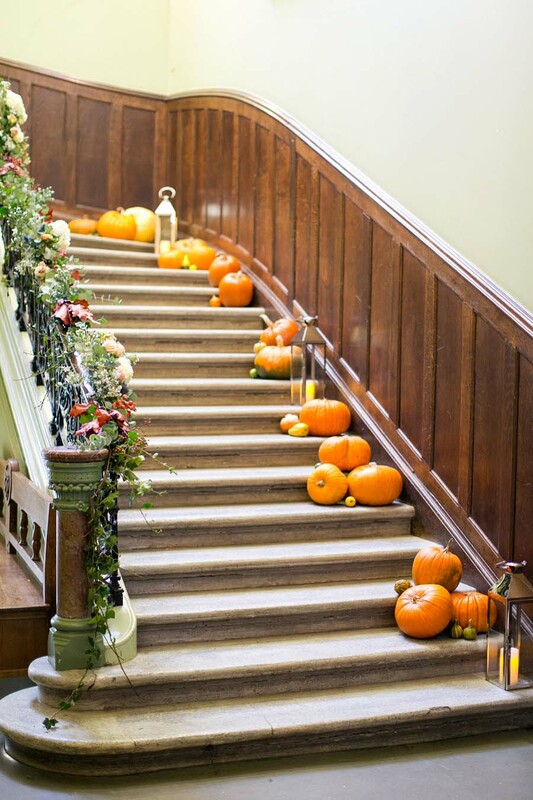 We also had an assortment of pumpkins lining the main stairwell, with flowers and vines wrapped around the banister. 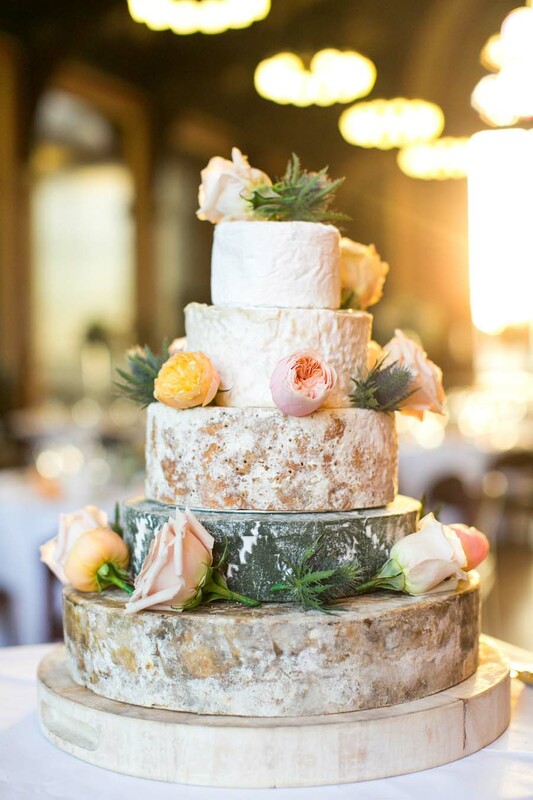 As cheese lovers, we chose the scrumptious Beatrice Wedding cheese cake from the Fine Cheese Company, which had a selection of the cheeses we are so fond of! 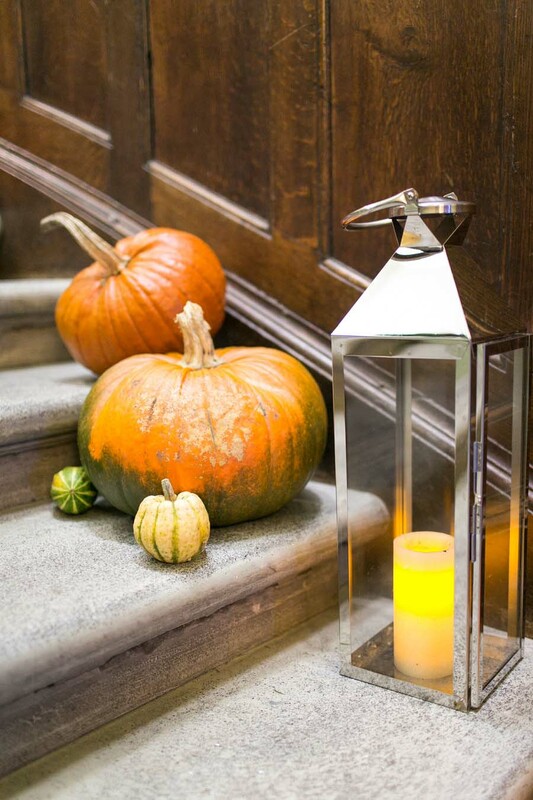 Relax and enjoy the day that you’ve been planning for so long! 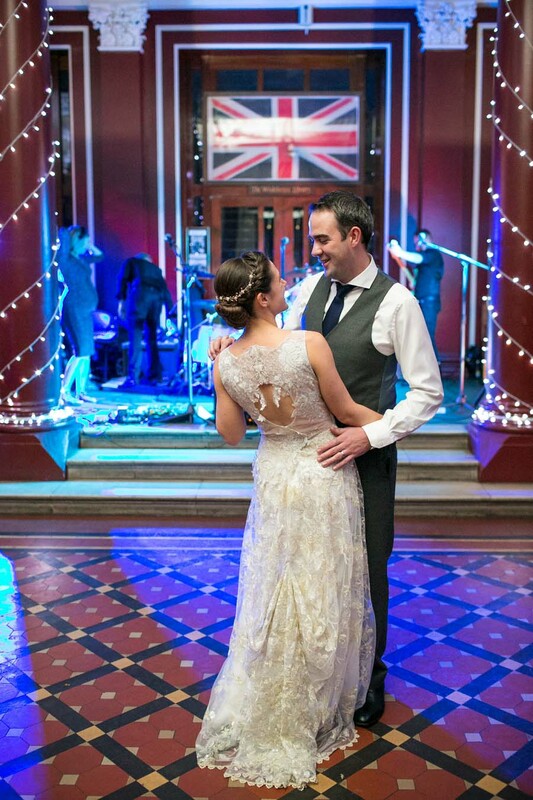 Our first dance was to ‘The Wonder of You’ by Elvis Presley. 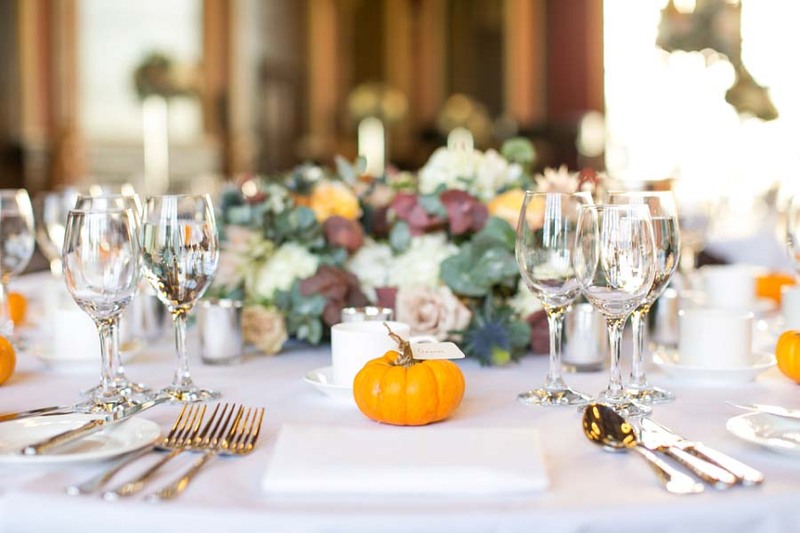 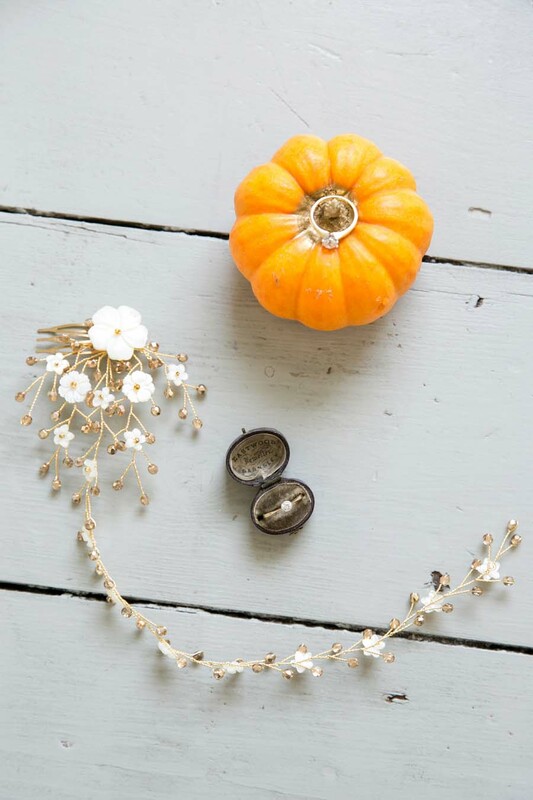 Planning an autumnal wedding? 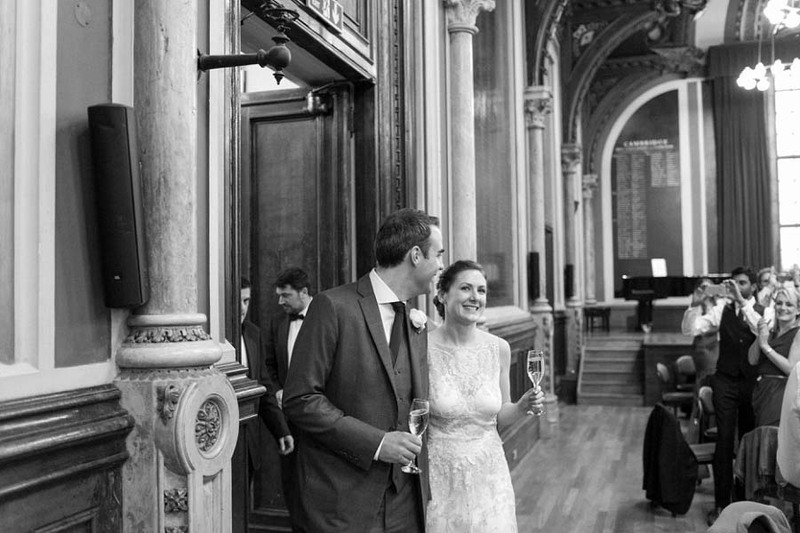 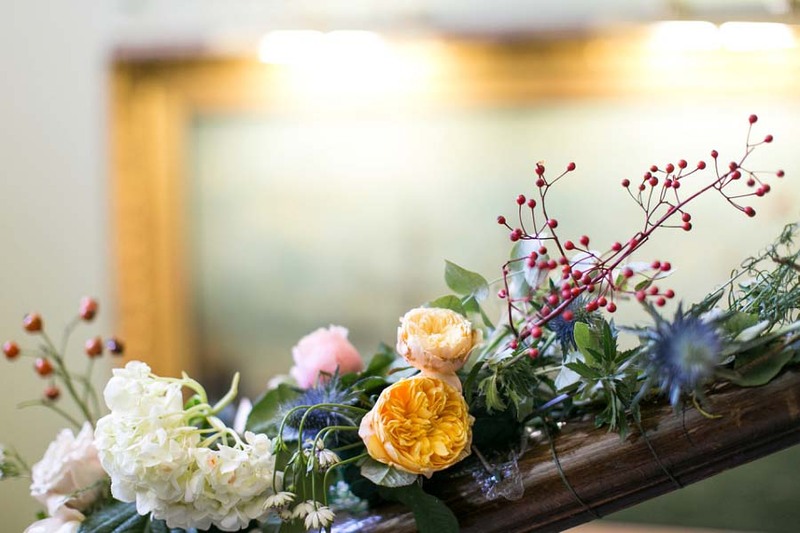 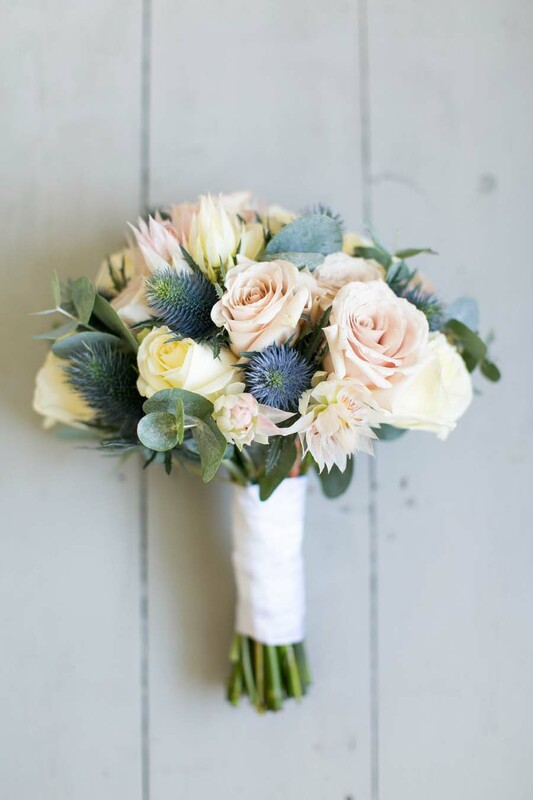 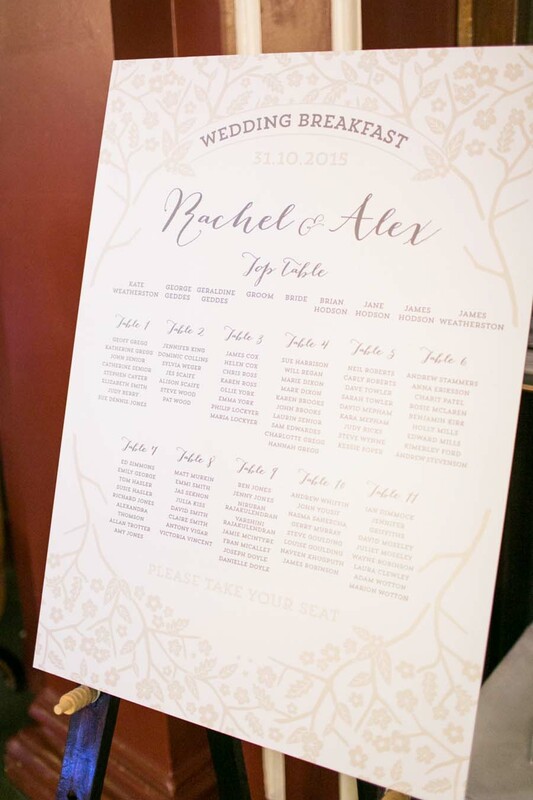 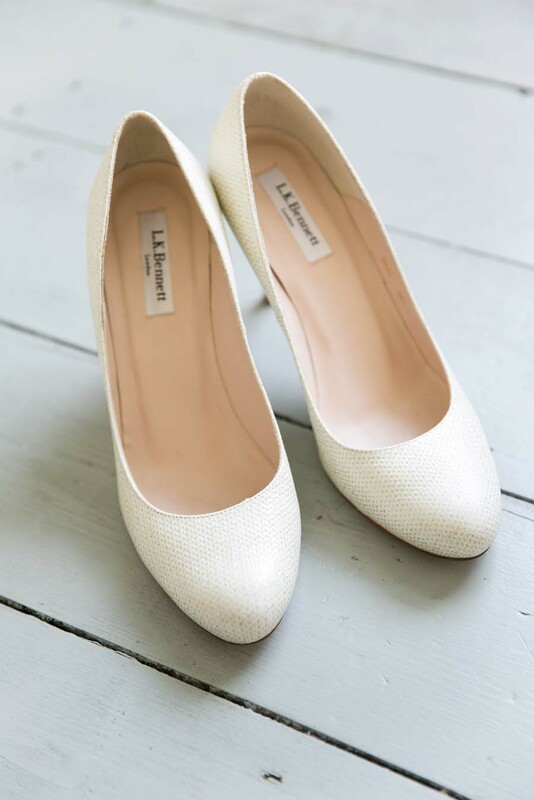 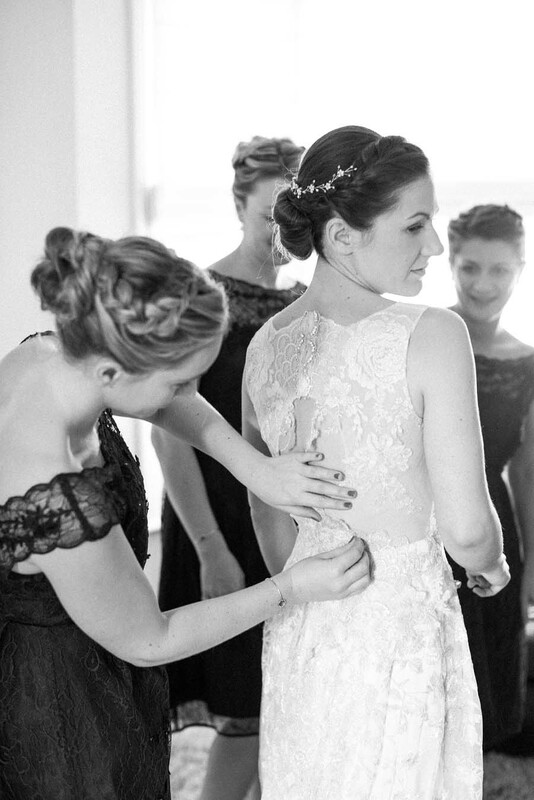 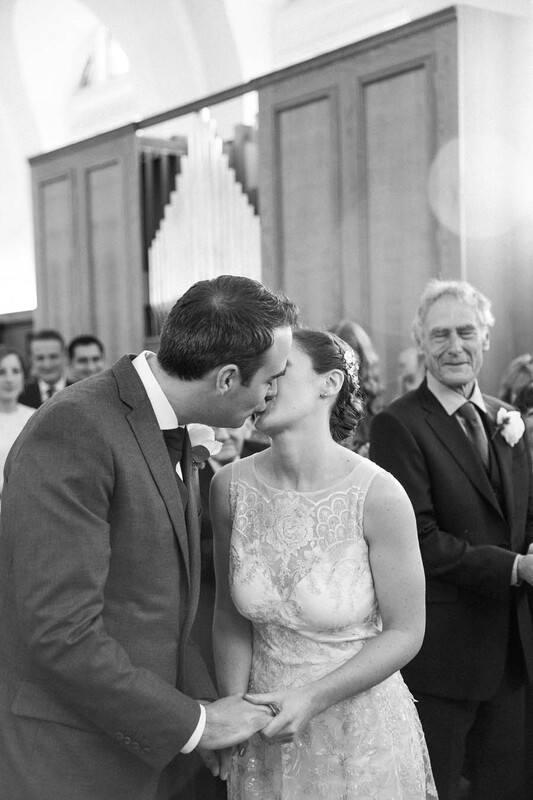 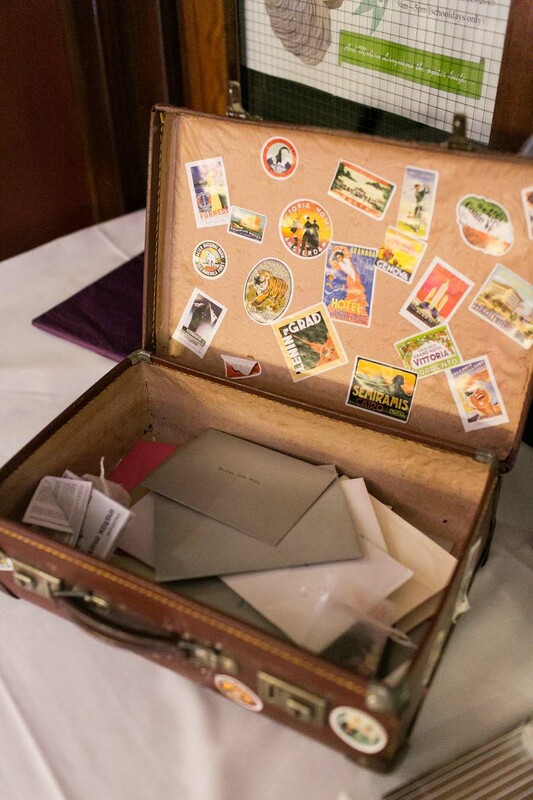 There are some really cute ideas in this pretty London wedding. 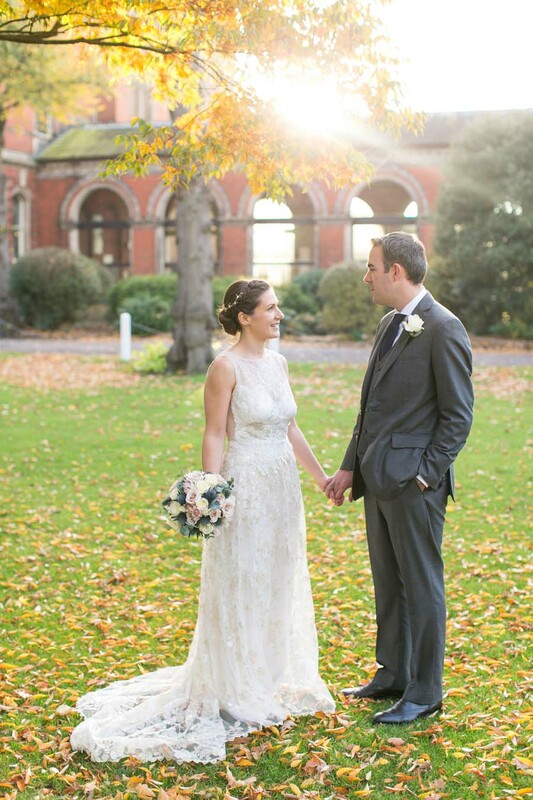 What a wonderful autumn wedding! 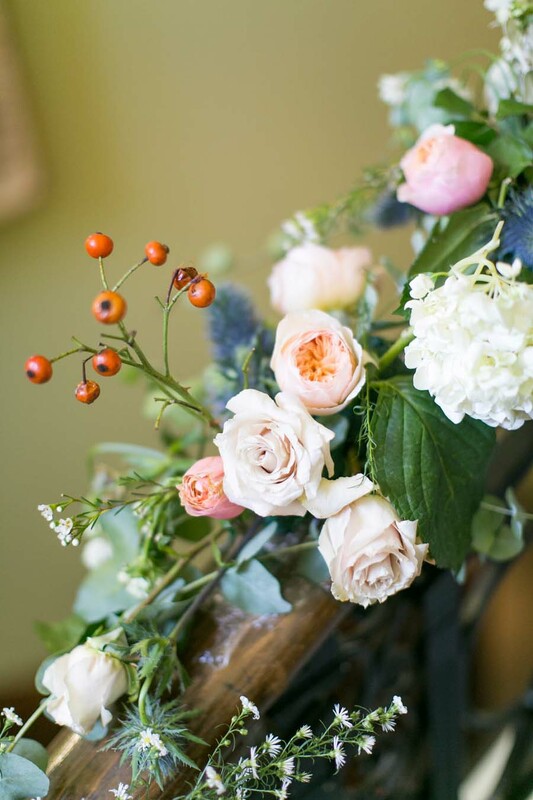 Despite not narrowing down what colors to use for the flower arrangements, they look absolutely fabulous! 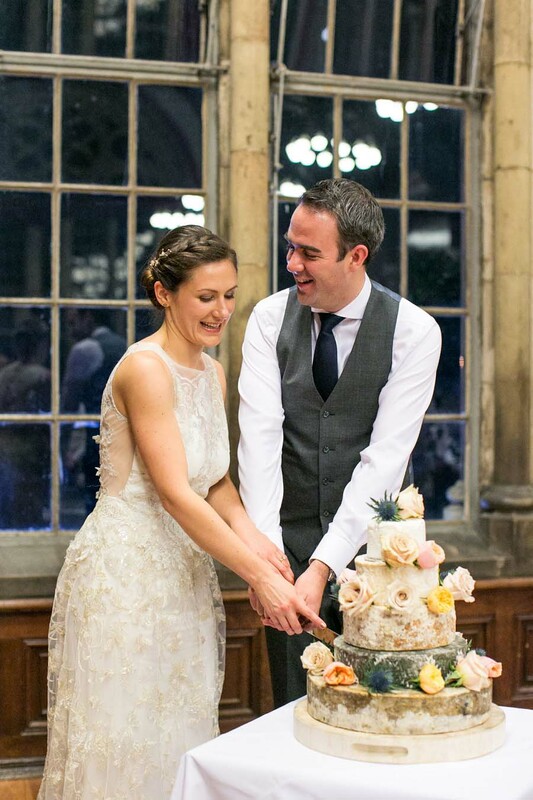 I love that they chose to do a cheese cake from the Cheese Company – that seems quite unique! 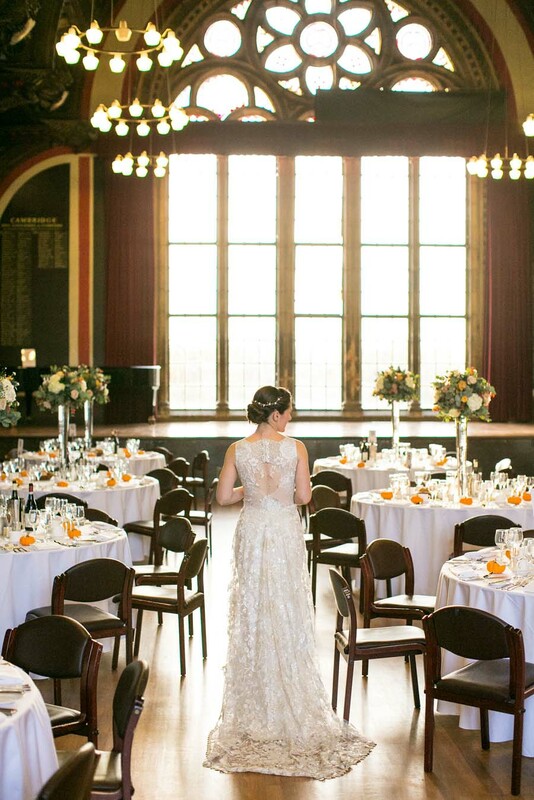 Gorgeous venue as well, and the photographs are stunning! 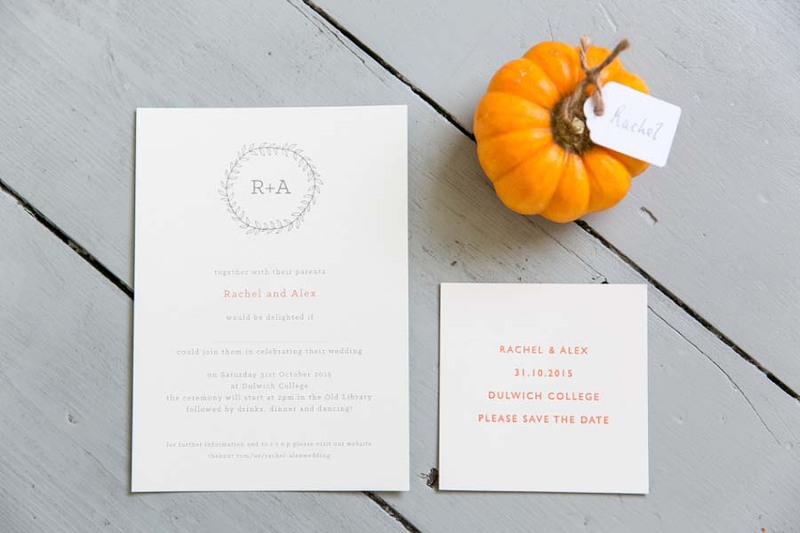 The wedding inspiration is so cute and i like the pumpkin,it looks so lovely!Thanks for sharing!